A fire at Kiss Club in Santa Maria over the weekend took a turn for the worse as over 200 attendees died of asphyxiation and smoke inhalation. SAO PAULO, Brazil — A fire at a nightclub in southern Brazil may have been caused by a flare lit on stage by a live band, according to witnesses to the blaze, which killed at least 231 people early Sunday. Authorities in the southern city of Santa Maria spent the morning rescuing survivors and wading through the tragic aftermath of one of the most deadly fires in a decade. Earlier reports had placed the death toll higher. There were indications that it could still rise. “There are so many bodies that we couldn’t get all the way to the back of the nightclub,” Lieutenant Moisés da Silva Fuchs told local media, referring to the now-destroyed Kiss club in Santa Maria, near the Uruguayan and Argentine borders. The country awoke to troubling images of firefighters and civilians pulling people from the smoking building, and the news has shocked the country. A tearful President Dilma Rousseff announced she had canceled plans to attend a summit in Chile and would be traveling instead to Santa Maria. “I’d like to tell the population of our country, and of Santa Maria, that we are all together in this moment,” Rousseff said. Many of the victims were students at local universities, according to witnesses. Fire officials told the Globo television station that the main door was locked when the fire started, but that was denied by Lucas Cauduro Peranzoni, also known as DJ Bolinha, the resident DJ at the club. At nightclubs in Brazil, it’s common for patrons to accumulate a bar tab throughout the night, which they pay in order to be able to exit. Several of the worst fires around the world in recent decades have been at nightclubs. A welding accident reportedly set off a Dec. 25, 2000, fire at a club in Luoyang, China, killing 309. 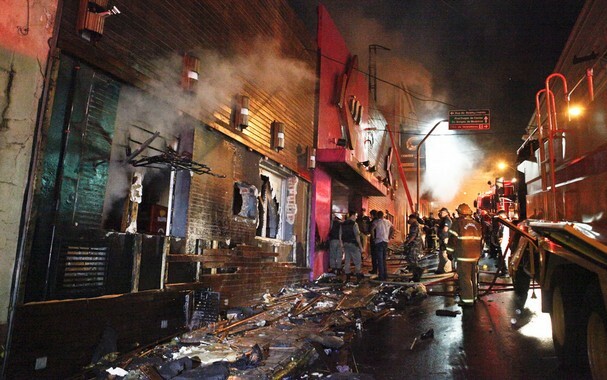 At least 194 people died at an overcrowded working-class nightclub in Buenos Aires, Argentina, in 2004. A blaze at the Lame Horse nightclub in Perm, Russia, broke out on Dec. 5, 2009, when an indoor fireworks display ignited a plastic ceiling decorated with branches, killing 152.